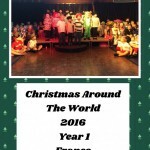 Redesdale Primary School » Year 1 on stage at the Christmas Show! Year 1 on stage at the Christmas Show! Year 1 enjoyed singing ‘l’etoile de Noel’ in French for our school performance ‘Around the World’. It was hard work but they all did a brilliant job. Well done everyone! Huge thanks to all the parents who provided their amazing costumes.